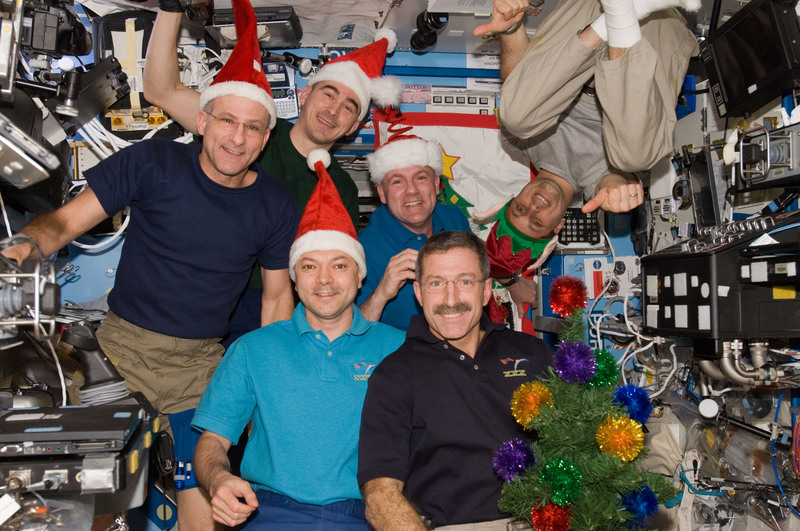 Christmas and New Year are celebrated in space; it’s important for crew moral! 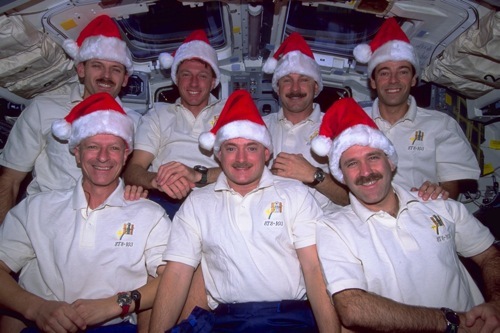 For the occasion, more festive meals are provided along with accessories (hats, a small Christmas tree) to help the astronauts get into the Christmas spirit. It may initially seem surprising that a space mission (and what’s more one where the astronauts live in space and which is therefore subject to the strictest security requirements imaginable) would be concerned with providing “good food” for astronauts. Surely respecting nutritional requirements with healthy and balanced food should be enough… but that’s not the case. Just like on Earth, the astronauts’ performance depends on their moral. And it has been shown that nutritionally-effective but bland meals deal a serious blow to this moral, especially for long-duration missions like that of the International Space Station (approximately 6 months). In this context, if crews are cut off from symbolic occasions like certain festivals, it has an effect on their mental well-being. Consequently, birthdays, national celebrations and others are marked in space, even if this is in a more restricted way than on Earth. And of course, Christmas and New Year are inescapable. But before we go any further, let’s talk about food, a key festive element. 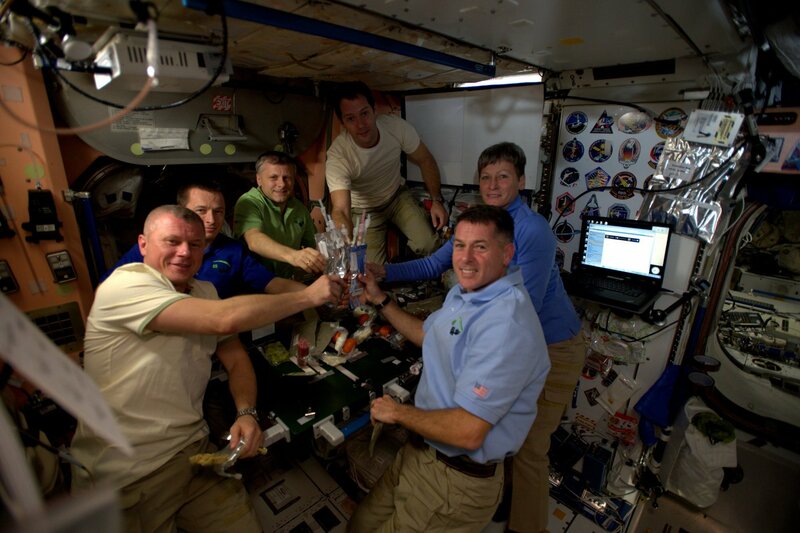 Before leaving, Thomas Pesquet mentioned several times that during his mission, the “usual” food on board the International Space Station would be livened up by dishes from the French culinary tradition. The French space agency, CNES explains that this orbital cuisine is based on a “collaboration between CADMOS and the hotel school of Souilla, and the teams of Ducasse Conseil.” CADMOS is the French centre for developing activities in microgravity and space operations (Centre d’Aide au Développement des Activités en Micropesanteur et des Opérations Spatiales), a CNES facility located in Toulouse. Ducasse Conseil is the culinary expertise company belonging to the famous Michelin-starred chef, Alain Ducasse. No doubt the Russian and American colleagues of the tenth Frenchman in space will appreciate this additional variety in their range of “authorized” meals. Yes, “authorized”, since the strict hygiene rules of the Russian space agency, Roscosmos and its American counterpart, NASA must be complied with for the safety of the crews (food poisoning in space would be a serious problem). CNES also says that the meals planned for Thomas Pesquet’s mission are “made with the support of the Breton company Hénaff” and that they “have received approval from NASA”. This delicate balance between safety standards and culinary creativity aims to avoid routine. 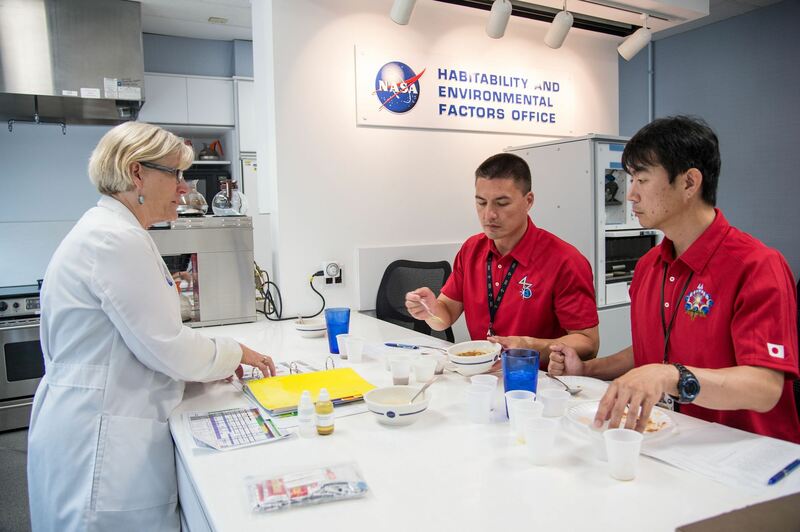 The space agencies know that recipes that are too similar can turn mealtimes, which should be the moment for some rest and relaxation into a frustration capable of compromising a crew’s enthusiasm. On the ground, before leaving, the astronauts taste the dishes that will be served to them. Contrary to popular belief, their food planning doesn’t include their favourite dishes; an element of discovery and surprise is needed to avoid any monotony. Consequently, celebrations are a perfect opportunity to break the culinary routine. So, the Americans always celebrate their famous Thanksgiving in November with the traditional turkey… in this case dried and in a sachet. But it is important to provide turkey so that the American astronauts do not feel cut off from an event which is part of their culture. It is also the opportunity for them to share it with their colleagues from other countries; an element of cohesion for the crew. Of course, Christmas and New Year cannot be celebrated without their own special meal. Once again, a small deviation from the strict dietary dishes is allowed. A classic on orbit: the use of Mexican tortillas, including for the foie gras if there is some… This may seem like a transgression, but in fact the tortilla has been chosen because it produces considerably fewer crumbs than bread. In weightlessness, such debris would quickly spread throughout the space station and if it was inadvertently inhaled, could cause respiratory problems… Safety first! While the concept of a good meal is therefore retained for Christmas and New Year, the functional, technical setting of the ISS modules does not seem ideal for getting into the mood. Fortunately, wisely-chosen accessories, that don’t take up much space, have been taken into space. Red Santa hats are stored for those who wish to wear them, along with small fabric or miniature Christmas trees, garlands and even stockings for gifts (obviously symbolic, but the intention counts tremendously), despite the fact that there is no chimney for Father Christmas (as you’d expect!). There’s also a small bonus to celebrating Christmas and New Year in space. 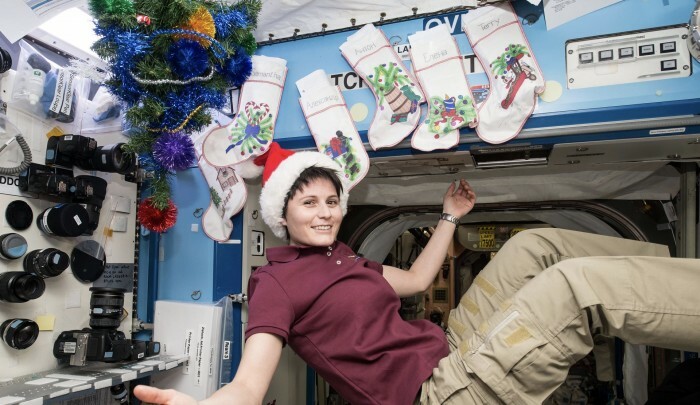 Firstly, the space station is always home to some Russians, so Christmas is celebrated twice, the Christmas on the 25 December of the Gregorian calendar, but also the Russian Christmas of the Orthodox calendar (in early January). For New Year, since the ISS orbits the Earth once every 90 minutes, its crew can enjoy marking the event for each time zone they fly over! Just one thing: alcohol is officially banned on board. 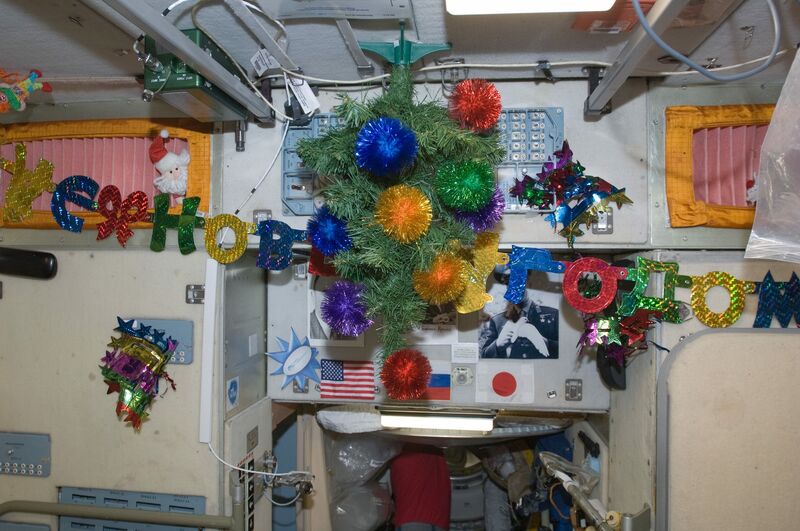 It is important to note that Christmas and New Year festivities were celebrated before the time of the International Space Station. For a small space flashback on this subject, here are 3 examples: Apollo 8, a Skylab space station mission and the space shuttle’s Father Christmas. The most unusual Christmas on orbit is probably that of the Apollo 8 mission. If only because it took place on lunar orbit! It was December 1968 in the midst of the race to the Moon. Uncle Sam’s secret services feared that the Soviets may pip NASA to the post due to the preparation of the N1 rocket, similar to the American Saturn V. Apollo 8’s objective was to send 3 astronauts to orbit the Moon several times as quickly as possible, without landing. Commander Frank Borman and his colleagues James Lovell and Williams Anders arrived at their destination on 24 December. When confirming the success of the manoeuvre, not without humour, James Lovell notified Houston by radio that “there is a Santa Claus”. It was during this mission that men saw an “Earthrise” for the first time. In fact, for an observer on the Moon, Earth would be almost immobile in the sky. However, on lunar orbit, the movement of the spacecraft means that our planet gives the impression of rising up from the celestial horizon. The NASA video below explains how this “Earthrise” was photographed by the Apollo 8 crew. During a live televised broadcast, the three men read a chapter from Genesis before the Commander closed by sending wishes from the crew to everyone on Earth. There is no doubt that Borman, Lovell and Anders believed that such a reading was suitable for the date of 24 December and that the passage selected (the creation of the cosmos) was consensual enough not to offend anyone. However, an American atheist would bring a high-profile lawsuit against NASA, arguing that the Government agency had violated the constitution by favouring one specific religion because Genesis is taken from the Bible. However, this would be rejected by the United States Supreme Court. Below, the reading of the text of Genesis by the crew of Apollo 8. With the advent of long-duration flights on board space stations, manned missions increasingly began to cover the end of year period, and from the start improvisation reigned in the need to mark the occasion. In the 1970s, NASA decided to conduct an ambitious “orbital home” programme. Launched in one piece using a Saturn V rocket, the space station called Skylab was a 90-tonne “sky laboratory” (as the name suggests) which orbited Earth. The third manned mission to Skylab took off on 16 November 1973. Three astronauts flew from Florida to the space station in an Apollo capsule. Given the planned duration of their stay (they would return on 8 February 1974), Christmas would be celebrated on orbit… Except that, for Gerald Carr, William Pogue and Edward Gibson, nothing festive had been planned! 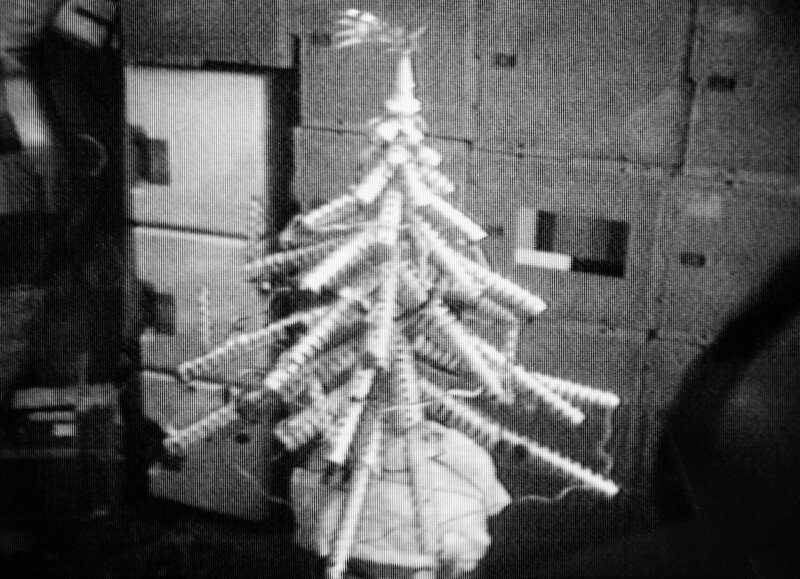 However, the three Americans decided to mark the event and made a Christmas tree using food cans. For NASA’s space shuttles, this period was generally avoided, but sometimes it was impossible to do otherwise! In 1999, the Hubble space telescope was in danger because its gyroscopes were breaking down, one after another. This risked a loss of control over the precious space observatory, which would be tantamount to writing off the billions of dollars invested in the programme. NASA therefore urgently organised space shuttle flight STS-103. Discovery took off on 20 December towards the wounded telescope with 7 astronauts on board including the Frenchman Jean-François Clervoy and the Swiss astronaut Claude Nicollier, both from the European Space Agency (ESA). Once the mission objectives had been successfully completed, with the ground’s approval, the 7 men could celebrate Christmas. Claude Nicollier therefore provided a good ration of Swiss chocolates, in honour of his country. The Cité de l’Espace contacted Jean-François Clervoy about Christmas in space. He told us that the Christmas meal also included duck foie gras on Mexican tortillas, cassoulet and salted pork with lentils. The astronaut has great memories of this Christmas meal, but also a lesson for our future: “Christmas in space is the chance to reflect on the cycle of life and birth. In our spacecraft, we were like seeds sent into space to sow the future generations that would explore even further into the cosmos and the world of the oceans to seek the answers to our future.” Jean-François Clervoy also told us that Father Christmas came to pay them a visit, “who knows how he got in, no-one ever knew he was there – crew secret”. A way for the astronauts to retain the intimacy of this orbital Christmas. 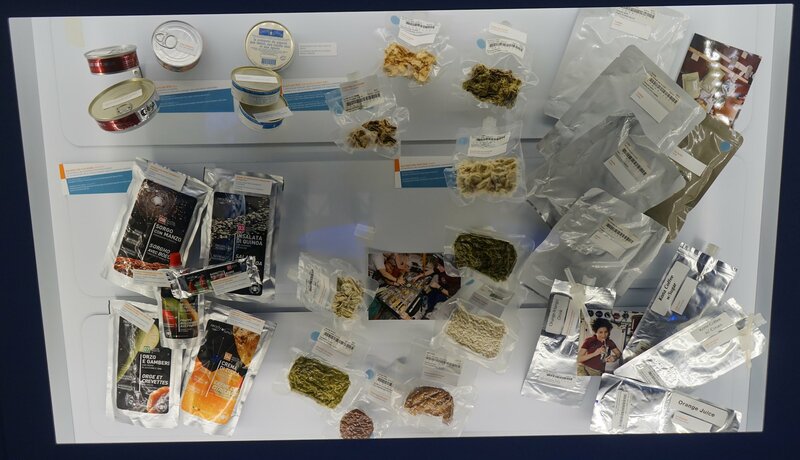 Would you like to know more about food in space? Then you’re in luck, the subject is covered in detail in the Astronauts Expo at the Cité de l’Espace. There you will see genuine rations designed for space missions and particularly those cooked by the French company Comtesse du Barry and taken into space by Jean-François Clervoy. You can even buy similar meals in the store at the Cité de l’Espace. Also within the Astronauts Expo, you can cook your own orbital meal during an activity session. This subject was demonstrated in Episode 9 of our video series “Live with Thomas Pesquet” below (at 00:50).